The mist was thick, fog-like. It blew in gusts under the street-lamp like sheets rippling on a clothesline on a blistering summer day. But this was winter, bitter and frozen. Alan stepped out on the stoop for a smoke to settle his nerves. He never smoked in the house. As long as he smoked he never liked the smell of it. 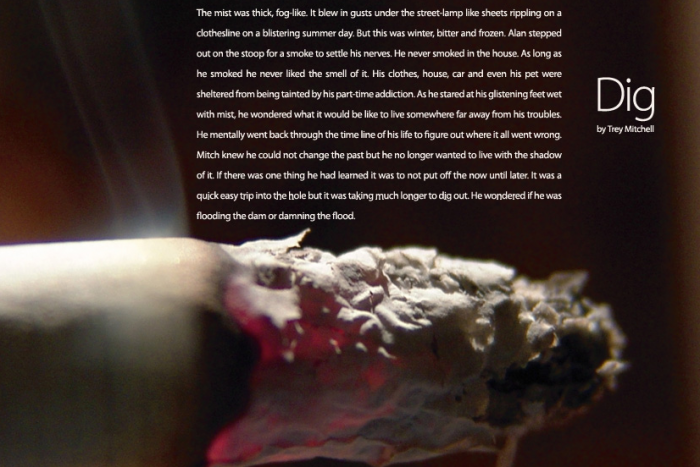 His clothes, house, car and even his pet were sheltered from being tainted by his part-time addiction. As he stared at his glistening feet wet with mist, he wondered what it would be like to live somewhere far away from his troubles. He mentally went back through the time line of his life to figure out where it all went wrong. Mitch knew he could not change the past but he no longer wanted to live with the shadow of it. If there was one thing he had learned it was to not put off the now until later. It was a quick easy trip into the hole but it was taking much longer to dig out. He wondered if he was flooding the dam or damning the flood.